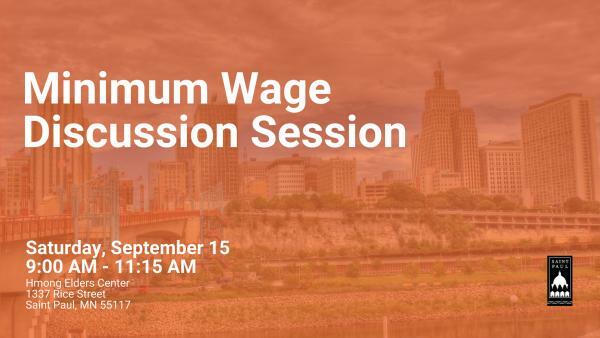 This is the third of four public sessions on minimum wage in Saint Paul. This meeting will focus on the results of the Citizen Leagues’ final report, economic analysis, and recommendations by the Study Committee surrounding a future ordinance. Download the agenda here. Share on Facebook here. For those unable to attend the public input sessions in person, comments can be emailed to minwage@citizensleague.org or a voicemail can be left at 651-401-2474. If you need an accommodation to participate in this event please contact Adrian Benjamin as soon as possible via email at adrian.benjamin@ci.stpaul.mn.us or by calling 612-219-8659. Interpreters are available upon request. Please contact Adrian Benjamin via email at adrian.benjamin@ci.stpaul.mn.us ​ or by calling 612-219-8659 at least 5 days before the event to request assistance. Los intérpretes están disponibles a pedido. Tenga a bien enviar un correo electrónico a adrian.benjamin@ci.stpaul.mn.us ​ por lo menos 5 días antes del evento, para solicitar asistencia. ​Turjumaano ayaa diyaar ah hadii loo baahdo oo la codsado. Fadlan email u dir adrian.benjamin@ci.stpaul.mn.us ​ ugu yaraan 5 cisho ka hor xiliga dhacdada si aad u codsato kaalmo. ​Muaj cov neeg txhais lus pab. Yog xav tau thov email adrian.benjamin@ci.stpaul.mn.us 5 hnub uantej lub rooj sablaj mus thov kev pab. For more information about the Citizens League Phase 2 and Study Committee process, please visit https://citizensleague.org/projects/minimum-wage/.